City Haven Massage Therapy also operates from a clinic at Mercy Place Parkville – Monday to Saturday. Mercy Place Parkville is located at 1 Willam Street, Parkville. 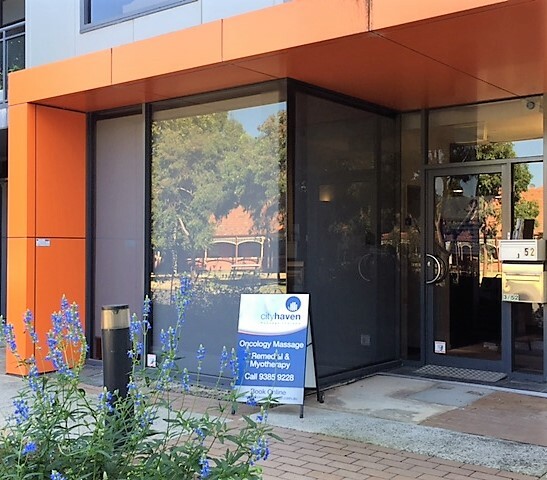 Our on-site clinic can be accessed by the public at 52 Cade Way, Parkville. We offer a range of services at our Parkville clinic including Myotherapy treatments with Charlotte & Angela. In addition, Charlotte & Geraldine specialise in offering a gentle approach with treatment for people living with cancer. Our Parkville therapists, Charlotte & Geraldine, are also qualified Oncology massage therapists. This treatment style is also very appropriate for the elderly, post-operative clients and anyone effected by stress and anxiety. For regular Myotherapy treatments to treat pain and loss of movement from poor posture or injury, please book in with Charlotte or Angela from our Myotherapy team. City Haven rooms offer a fresh, peaceful and comfortable space in which to receive a treatment and switch off from the outside world.2 hour street parking is available along Cade way, Willam Street and surrounding roads. We recommend you arrive early for your appointment to find a suitable park.Our Parkville clinic is accessible for wheelchairs and there is a dedicated car park right outside our clinic entrance for accessible parking dedicated for people who have an eligible permit. Public Transport is readily available at our doorstep with the Route 505 Bus stop (45660) a 2 minute walk from our clinic.Our Parkville clinic is within easy driving range from the following suburbs: Moonee Ponds, Ascot Vale, Kensington, Brunswick, Travancore, Flemington, North Melbourne and North Carlton. It is also a 10 minute drive from the Peter Maccallum cancer centre, Frances Perry House and the Royal Children’s Hospital Melbourne. Charlotte Bosson, Angela Smith & Geraldine Earle are your therapists. Charlotte & is a qualified Myotherapist and Angela is a Remedial Massage Therapist who is currently studying Myotherapy at RMIT. Charlotte & Geraldine hold Oncology Massage qualifications. Geraldine is a Remedial Massage Therapist. City Haven Massage Therapy operates out of a modern strength training clinic ‘Kieser Training’ – Monday to Saturday inclusive by appointment. After-hours sessions are available on some weekday evenings, and Saturdays. Kieser Training is located at 733 Whitehorse Road, Mont Albert and is easily accessible from the Eastern Freeway. Look out for the City Haven Massage A-Frame sign outside Kieser Training Mont Albert. We are next to Quest Mont Albert Serviced Apartments. City Haven rooms offer a fresh, peaceful and comfortable space in which to receive a treatment and switch off from the outside world. Parking is available free of charge onsite or 2 hour parking is available in nearby streets. Please note the clinic is on Level 1 so is not accessible for wheelchairs. Public Transport is readily available at our doorstep with the Route 284/315 Bus stop right outside the clinic and the 109 Tram stop very close by. Our Mont Albert clinic is within easy driving range from the following suburbs: Balwyn, Balwyn North, Surrey Hills, Box Hill, Mont Albert, Camberwell, Hawthorn, Canterbury, Deepdene, Burwood, Blackburn, Doncaster. Health Rebates apply with all major health funds, depending on your level of cover. A Hicaps/Eftpos facility is available at Mercy Place Parkville so on the spot claims can be offered for participating health funds. We accept Mastercard, Visa, American Express, Eftpos, Cheque and Cash. City Haven is a full member of the Massage and Myotherapy Australia Association and holds comprehensive AON insurance. All employees and contractors employed by City Haven Massage abide by the moral ethics and codes of their association, are fully qualified, insured and possess a Level 2 First Aid Certificate.